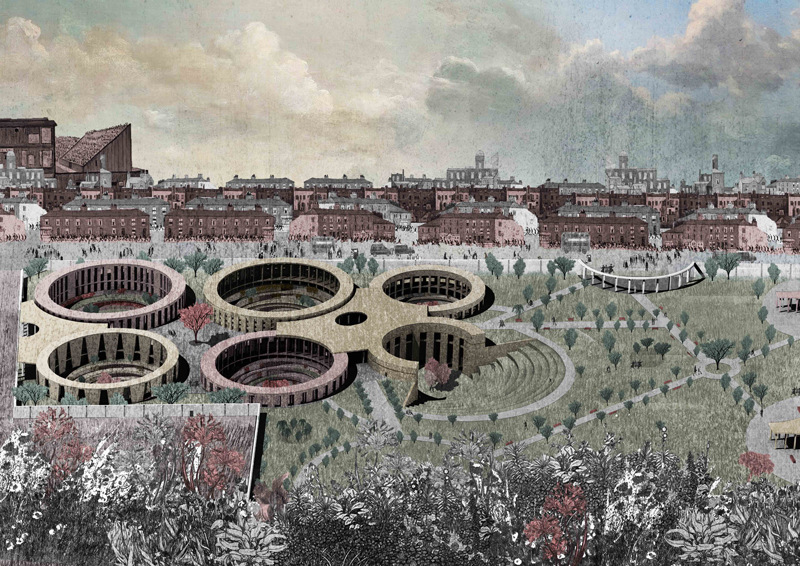 Invited by the National Grid to propose redevelopment solutions for redundant urban gasholder bases, 318 Studio imagine a poetically innovative memento-mori for the final curtain. 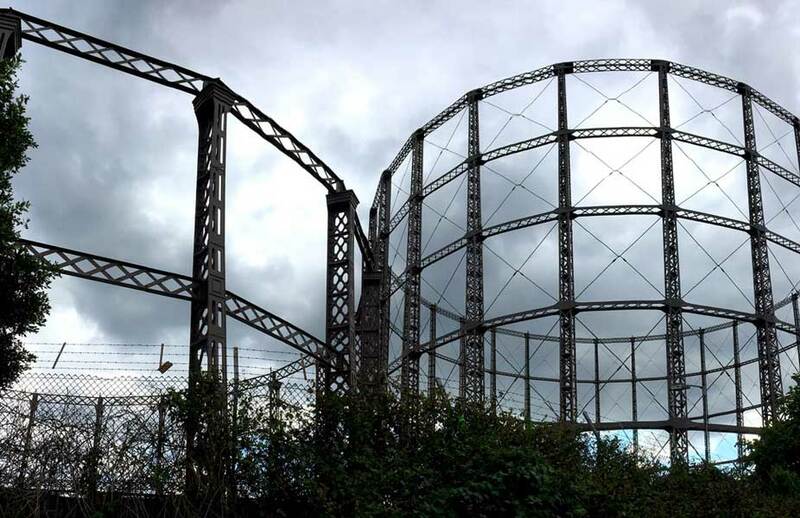 National Grid Properties, which manages the company’s surplus land, has a portfolio of former gasholders, which will be dismantled over the coming years. The engineered bases of below-ground holders represent large voids in the sub surface. Once dismantling has occurred, if left empty and unused these voids present potential health and safety hazards, the default practice is to backfill the holder and leave the site level for sale for potential developers. Backfilling however is an expensive and labour intensive operation along with the inherent transport and environmental costs. National Grid Properties therefore invited architectural proposals for alternative uses of the voids. ‘I can’t remember how we initially came up with the idea of a funereal solution’ says Miller. With project hand-in scheduled for October 10th, maybe it was the proximity of the “season of mists and mellow fruitfulness’3 ushering in autumnal poppy day remembrances or even the weighty resonance of the word void itself which steered the team’s imaginations towards their elegiac proposal. Economic feasibility was also a consideration and as the design team began their research they soon realised that what they were proposing was a much-needed urban resource. Another important discovery of the team’s research was that landscape architects had designed many of the 19th Century London cemeteries. They were places for people to go and enjoy green open spaces along with their obvious memorial aspect. Further inspiration came from the Circle of Lebanon a gothic architectural highlight found in Highgate Cemetery. This structure comprising a sunken ring of tombs is built around the roots of an ageing Cedar of Lebanon tree from which the Circle gets its name. Thus things began to fall into place, the circle of tombs echoing the circular gasholder bases along with the obvious metaphorical meaning. The cemetery idea was early on replaced with the idea of a columbarium, a place for the respectful and public storage of cinerary urns holding the ashes. The reason for this shift was twofold, one was that the team did not want to get involved with the technicalities of what to do with the actual dead bodies and secondly they had discovered that more than three times as many Britons choose to be cremated rather than buried. The idea evolved of a series of niches built into the structure, which would hold the loved ones ashes and may be adorned/ decorated to hold personal tributes. blending soft landscaping with architectural elements the design continues the historical tradition of the relationship between park and cemetery. 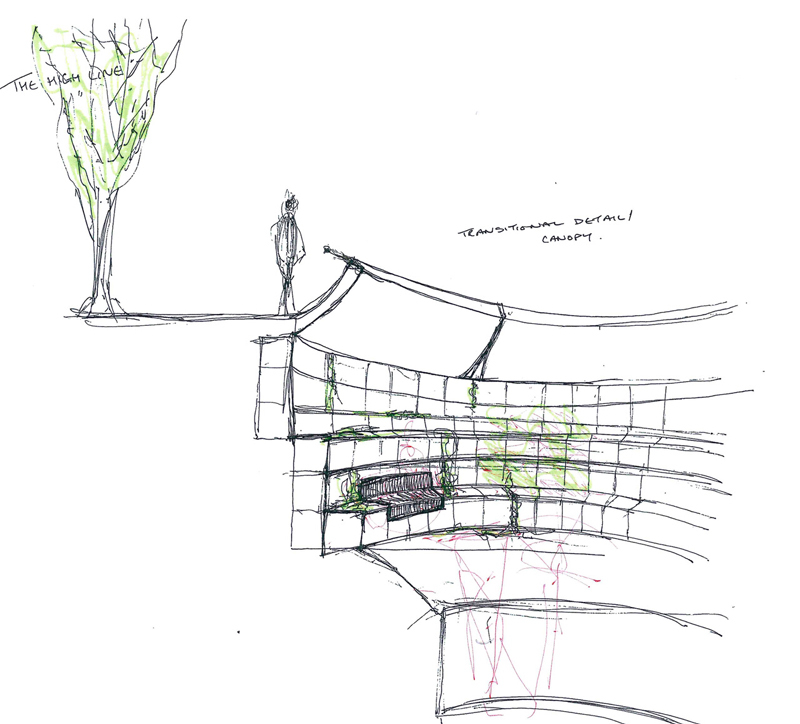 The intention being to extend the public park and gardens of the surrounding territory into the depths of the publicly accessible terraced columbaria. In this respect Earth to Earth is Wordsworthian in scope, echoing the Romantic poet’s views on the restorative and contemplative role of nature. These lushly landscaped arenas, “mid the din of towns and cities”8 are proposed as a place where nature and architecture combine to imbue an ethos of calm tranquility. Desirous to re-create something to be admired, 318 Studio’s proposal for redundant gasholder bases is a courageous statement of intent, not being afraid of staring into the abyss, they have produced an architecturally lite yet spiritually profound scheme which will, in time, surely become as much loved as the iron-maidens it was designed to replace.